Castle Durrow Hotel, is now one of Ireland’s most luxurious Irish Country House Hotels and is located on the N8 Dublin to Cork Road ( one hour from Dublin), in the midlands of Ireland, adjoining the quaint village of Durrow,Co Laois. Built by Capt. William Flower (later to become Viscount Ashbrook) in 1716 as his family home in the Midlands of Ireland, its pre Palladian design and formal gardens were the height of fashion in their day and the grey / blue cut stone contrasts with the breathtaking views of the landscape. Castle Durrow Hotel in County Laois is a piece of Irish history embodied in stone. As a building, its massive solidity is combined with an old-world charm and elegance that is distinctive and attractive. It is the creation of an Anglo-Irish landlord family, a relic of an age that has vanished forever. Castle Durrow is the first country house of importance that still stands in close to its original condition and is one of the few 18th century houses for which precise building records survive. Built by earlier generations of Durrow inhabitants, the legacy of Castle Durrow is its unique sense of proportion, restrained good taste, and a spaciousness that has largely disappeared from present-day living. Complex traditions unite at Castle Durrow – it was built and lived in during a period of high taste and high culture. Formerly the home of the Flower family, Barons Castle Durrow and Viscounts Ashbrook, it was built in the early 18th century (1712 – 1715) when domestic architecture in Ireland was developing an independence of the need for defence and economy that had characterised earlier construction. The construction began after the Cromwellian and Williamite wars; this resulted in a new Protestant aristocracy that was beginning to enjoy the lands that they had inherited. The fashion of this new era dictated that inherited land should now separate the burden of agriculture from that of class, and create elegant mansions that could not in any way resemble the farmhouse type buildings of the previous age. Colonel William Flower commenced with the construction of the Manor in 1712. The Flower family assumed residency of Castle Durrow in 1716 and continued to expand and improve their Estate on various occasions during their 214-year reign. Past research indicates that the Ashbrooks were generally regarded as benevolent landlords and of course the largest employers of Durrow Village. In 1922 the banks finally foreclosed and the Flower family was forced to relocate back to Britain. Subsequently, the property was sold to Mr. Maher of Freshford, Co Kilkenny who was primarily interested in the rich timber reserves of the Estate. By 1928 the old hard wood forests of Durrow were scarce. Eventually the Land Commission divided up the arable portions of the property and the Forestry Department took over many of the woods for further plantation. During this time the great manor house which stood in a commanding position near the town overlooking the beautiful River Erkina remained entirely empty for a few years. The Bank of Ireland acquired the town and consequently for the next 40 years house property in Durrow was purchased from that bank. 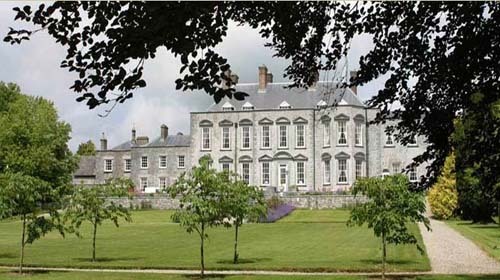 In 1929 with the Bishop’s approval the Parish of Durrow acquired the Estate for the purchase price of £1800 and Castle Durrow was transformed into a school, St Fintan’s College and Convent. The advent of a school at Castle Durrow was testimony to the fact that beautiful buildings of the past could be used in the modern world. Peter and Shelley Stokes bought the castle in 1998 and transformed it into the luxurious Castle Hotel it is today. 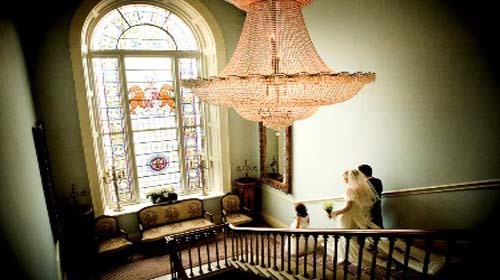 The restoration of Castle Durrow Country House Hotel, in County Laois, the midlands of Ireland began in 1998. Many of the original 18th and 19th century architectural features were intact and were carefully restored and repaired. The plentiful bedroom accommodation of Lord Ashbrook’s luxurious home was lovingly and individually decorated and furnished by its new owner Shelly Stokes. Each room was given unique attention and created into superior hotel accommodation as if it were to be her own bedroom. 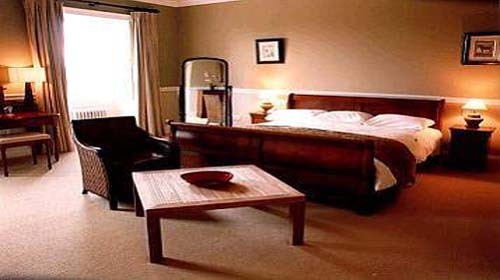 This superior hotel accommodation in the midlands of Ireland is distinctive in its many shapes, spaciousness, elegance and attention to detail. Whether you are staying in one of our Oriental Style Bedrooms at the top of the house, in one of the De Luxe Bedrooms in the East Wing, in one of the two-bedroomed Family Rooms, in one of the Castle Yard Rooms, or in one of the very special Master Rooms, you’re sure to enjoy your stay and feel relaxed in the peace and tranquillity that we have at Castle Durrow Hotel. 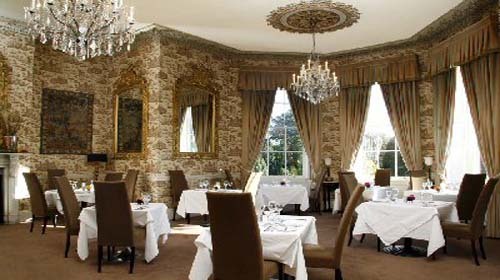 Castle Durrow’s Restaurant in County Laois overlooks the magnificent gardens, is relaxed and very informal. It is open to non residents and reservations are recommended. Modern Country House cooking is the style of cuisine in this Country House Hotel, located in Laois, Ireland. Experience culinary excellence as we serve inspired regional and international favourites which are prepared from the finest local produce with herbs & vegetables from our own kitchen garden and complemented by our carefully selected wines. Our Buffet Breakfast of fruits, cereals, smoked meats & fish, together with the now famous tower cooked breakfast is a great way to start your day in the country. Our five course Table d’Hote Menu (only €55) changes every week and has daily specials of locally sourced game and fish (in season) or meats. Our wine list is made up from the most popular regions of France & the ‘New World’ and like our Bar prices, are sensibly priced. The main dining room is considered one of the finest in this Manor House Hotel with its spectacular views and comfortable furnishings. The decor is a bright and comfortable with a mix of Modern and Classical styles and can accommodate up to 50 guests. Our private dining room can accommodate 16 guests. Discover your inner senses by treating yourself to a visit to our luxurious and tranquil beauty salon in Castle Durrow Hotel, located in the midlands of Ireland. We offer a wide variety of beauty and spa treatments from the French Matis range that will help balance body, mind and spirit, including; massage, facials, manicure, pedicure, spray tan, body wraps, make up. There is no shortage of parking and accommodation can be arranged for those not staying at Castle Durrow in specially selected local town and farm houses. Only 90 minutes from Dublin and centrally located, you can rely on us to create the perfect ambiance for the perfect occasion. Our conference and meeting facilities and venue, ideally located in the midlands of Ireland cater for a wide variety of corporate and personal events and can accommodate from 10 to 160 delegates (theatre style). This versatile facility is self-contained and includes a bar area and separate catering facilities. Smaller meetings can be held in our Tiffany Room. The peace and tranquillity at Castle Durrow will allow for a productive and worthwhile break from the office environment and together with good food and relaxed atmosphere, will reward your delegates for work done. At Castle Durrow we ensure individual service for all conference and meeting organisers by assigning our dedicated conference coordinator to personally oversee every aspect of your conference requirements, making your planning easy and successful. There is no shortage of parking and accommodation can be arranged for those not staying at Castle Durrow in local Hotels and Bed and Breakfasts in Laois. With the recent opening of the Monasterevin / Portlaoise bypass, Castle Durrow Hotel conference venue is now just over an hour from Dublin and centrally located in Ireland, we’ll ensure that your conference or meeting is professional, classy and well organised. To help make the booking of your conference or meeting easy we have complete packages for day and overnight delegates. Special rates for groups of 12 & over. Room Hire includes Flip chart, PowerPoint Data Projector, Pens, Paper & Mineral Waters. Clay Pigeon Shooting and Archery, which are regular activities at Castle Durrow and can be arranged at a few days notice. Minimum number is 8 maximum 20. Competitions can be arranged for your group. Tennis on our Omni Court all weather Court. Arrange a small group and we will set up a Barbecue in our Pavilion. Take long walks in the spectacular Slieve Bloom Mountains and follow the Heritage Trails of Laois, go fishing on the Rivers Nore and Erkina, visit nearby historical landmarks, go golfing in one of the many golf courses in Laois, or just sit back and relax and do nothing while we attend to your every desire… or play a game of Snooker in Lord Ashbrooks Billiard Room. Local Heritage Castle Durrow and the surrounding areas possess a myriad of hidden treasures of heritage and cultural interest for the visitor to explore. The Village of Durrow was developed under the patronage of the Viscounts of Ashbrook and is home to a number of historic buildings around the village green. Castle Durrow itself is one of the last large pre-Palladian houses to be built in Ireland and attracts many historians from both near and far. Durrow Village has a lovely, rustic atmosphere and friendly people. Nearby towns such as the ancient city of Kilkenny, Abbeyleix, and Cashel are among the most important heritage sites in Ireland and are a must for all touring visitors. In June the wooden bridge paddlers hold an annual sponsored charity Fundraiser. The 2005 Event took place on the river Nore with the proceeds being donated to the Cuisle Centre (Laois Cancer Support House Portlaoise). Other club activities include away trips to Bennetsbridge, Thomastown and Inistioge. The association, which have their own constitution, hold a very strict rule on safety. One of the most popular attractions for visitors are the majestic Slieve Bloom Mountains, boasting short and long walking routes, revealing hidden gems including waterfalls, geological sites and overwhelming scenery. Castle Durrow Gardens tour with Tanquy our organic kitchen garden expert. Crop rotation, organically grown vegetables and green house management. Let us know in advance and Tanquy will show you how its done.